Ratner, 2003: "I have never, ever seen a project get less protest than this"
Beyond his dubious statements about not touching the tax base and office jobs made during a 12/12/03 interview on WNYC’s Brian Lehrer Show, Forest City Ratner CEO Bruce Ratner's interview deserves some more scrutiny, as it gives a flavor of his debating style and highlights some questionable spinning, notably his rather premature assessment that the long-under-wraps, just-announced project had generated minimal protest. Photo from Ratner's 6/26/05 New York Times Magazine interview. Initially, at least, the project was about hoops, though later the developer latched onto the importance of housing, which now dominates the narrative. BL: It would transform the face of Downtown Brooklyn hand has people like the New York Times architecture critic [Herbert Muschamp] and fans very excited…. Residents of the neighborhood are less enthusiastic…yesterday we got dozens of e-mails from people telling us why they thought it was a bad idea… not wanting to lose the residential flavor of the neighborhood to the prospect of tax dollars used to subsidize another big business venture by a developer who has at least one that’s failed in the neighborhood... Tell us your vision for what you’d like to build there. BR: I don’t like to call things visions, particularly, y’know, ideas and so on. I think the first concept is really the importance of bringing professional sports, and in particular basketball, to Brooklyn. Brooklyn really is a sports town, basketball grew up in Brooklyn. It’s very important for the young people of Brooklyn. There’s a tremendous fan base. There’s a tremendous pride of place in Brooklyn that few cities have in this country, if not this world. Sports is so important to so many people. So the concept of bringing a team like the Nets, the New Jersey Nets to Brooklyn, is the first idea. It’s met with enormous positive reaction from huge numbers of people. I’m surprised myself at the kind of interest and--everyone just says, ‘Y’know what, this fits, it makes sense.' So that’s the first way this sort of started. Where fans see a stadium, Brett and Michael see acres of monetizable space—or, as they say on Madison Avenue, "inventory." Ratner stuck with a sports image. Second, the location—the location has more transportation going through it, the subways, Long Island Rail Road, than any other area of the city and therefore almost by definition, than any other area of country. And as such it is an ideal place to put an arena. In fact, when Mr. O’Malley, he took the Dodgers out of Brooklyn, this is where he wanted to put his stadium. Not exactly--O'Malley wanted a site nearby. Forest City Ratner's other statements have generally been more careful, though the press has too often been sloppy about this. BR: If you look at the area, it’s zoned industrial, right in the middle of neighborhoods, and it looks godawful. It’s got train tracks, it’s got industrial buildings, and it’s extremely unattractive, it’s like a scar in the middle of two neighborhoods. I’ve heard it described as a ditch. Note that Ratner seems to be using the 8.5-acre railyard for the project site as a whole, and leaves out the city streets and city property he needs. 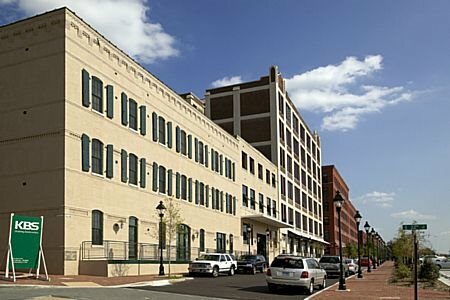 Also note that parent Forest City Enterprises, in cities like Richmond, VA, (right) has restored industrial properties. BL: Certainly the residents who were howling yesterday… don’t feel like they live on a scar or ditch, they feel like it’s their home, they feel like it’s a nice... accessible place from Manhattan that’s still a refuge from Manhattan which it wouldn’t be…so do you want to stand by those words, scar and ditch? BR: Yes, I do, because you know what, the thing is Brian, I don’t know if you were at the press conference there are about 15-20 people, that’s all, in a borough of 2.5 million, the same 15-20 people, who live—I respect it, I really do, they live in an adjoining neighborhood. You have to really—y’know, it’s important for news of course, to listen to all sides, you can’t let 15-20 or people decide something like this. The UN had protesters, Rockefellers Center had protesters. So you have to really look at it I have never, ever--I’ve done a lot of projects, I have never, ever seen a project get less protest than this. Here you have a major project, you have 25 news people at a press conference, and there are about 15 people with homemade signs out in front, in a borough of two and a half million people, at a press conference. First, the number of protesters grew considerably once area residents got a clearer sense of the proposed project as well as the bypass of community input. That's why Atlantic Yards now serves as a poster child for bad planning, perhaps the Penn Station of this generation. Also, only seven government officials got to vote--and quite swiftly--on the Atlantic Yards project: four appointed members of the Empire State Development Corporation board and the three members of the Public Authorities Control Board, the governor, Assembly Speaker, and Senate Majority Leader. BL: With all due respect, and this is not to say it’s a bad project… we got more than 15-20 e-mails, that could only be a small percentage of the people who actually are concerned. BR: Not necessarily. If you have 20 or 30 or 40 people who follow everything that’s going on, with all due respect and they all decide to send e-mails in. Did you get any positive e-mail? BR: --Yet you know, sir, that there are thousands of people, thousands, who are positive about it. What it says it there’s a small group, concentrated, that is listening, that is doing exactly what I said, and newscasters like yourself… said. What has to be done—let me say, I welcome, I really welcome input from all people, and that is the nature of our company. But at the end of the day, you can’t take 20 e-mails from a group that’s forceful, when you and I know that the vast majority of people think this is a great idea. BL: I always say whatever calls we have is not a scientific poll. BR: I want to say something. We welcome input. I have a group of guiding principles about this project. One is this has to be inclusive, the type of apartment buildings we have, the programming in the arena. You gotta have seats that are low-priced for people that live in Brooklyn. You can’t have all 100-dollar seats. We have to have a lot of seats between 10 and 20 dollars. It’s very important to make this inclusive. If you look at other projects that our company has done, you will find that to be the case. The largest is MetroTech, we have a Commons, every community group that passes through is part of it and so on. Our company is about inclusiveness. The record shows that. So, I really do understand, that if you live nearby, I understand how you feel about this project, very concerned and very anxious, I respect that. Well, there are a lot of rules at MetroTech. And the key thing about the arena is the amount of luxury suites. BL: I guess we should say the developer who wants to take the Nets from New Jersey and bring the Nets to Brooklyn, Bruce Ratner. Let me read you a few of the specific questions that some of these e-mails raised yesterday. Ratner briefly became combative, then calmed himself down. BR: If you want to talk about the project, I’m happy to do that, but to respond to specific e-mails, if they’re related to the project I’m fine about that. The first question was about public money and, as I noted, Ratner fudged the answer about making "sure to not hurt our existing tax base." BR: Our company is 80 years old, it’s publicly traded, still 50 percent family owned, we have built, in the last 18 years in this city, some 31 projects with 10 million square feet of feet of space, Atlantic Center is 400,000 square feet. What he failed to say is that the largest project in Downtown Brooklyn, which is MetroTech, 6 million square feet of office space is one, beautiful , two, highly successful, we have built 27 retail projects, including Atlantic Center, which contrary to what is being said, is very successful. I will say another thing: Our company brought the concept of big boxes to the borough. That’s very important… The important thing about Atlantic Center, which is what he’s complaining about is, that, unfortunately, in the borough of Brooklyn and Queens and so on, is that we do not, did not, have the large discount stories, which are in the suburbs. Discount stores, or good supermarkets like Pathmark would save a family of four $800 a year. The success of MetroTech is much more mixed, given that promises of local jobs weren't fulfilled. Ratner continued with his defense of big box stores: That is critical for the standard of living in our borough. We need stores like Target, we need that because people want to save money and buy quality goods. We need Marshall’s, which is in that shopping center. We need Party City, where some of them go get goods and don’t have to get ripped off. That shopping center has terrific stories. To the extent there are chain stores, a chain failed. A chain failed. Caldor’s went out of business, I couldn’t. When Caldor’s was there, it did 45 million dollars a year in business. Burlington Coat has opened in their place, so there’s not a single store that has failed. There’s not a single store that has failed in that location…. The bottom line is, what they don’t like is the architecture, they like the stores, they’re right about the architecture, we did not do a good job on the architecture. That’s true. The stores are great, they do well. Well, he changed his tune somewhat, since Forest City Ratner has pledged not to bring big-box stores into Atlantic Yards retail. As for no failures at Atlantic Center, the Department of Motor Vehicles is occupying what was once supposed to be retail space. Lehrer changed his tone, becoming more enthusiastic. BL: You have a great architect, Frank Gehry on this project… Can you get the Nets? BR: We will do our very best. I am sure we will do our very best. BR: My guess is that, in the next 30 to 60 days, they will pick a winner, and at that point it will take about two months to pass the necessary, the (National) Basketball Association, it will take us a year to go through the different processes and plans for the arena. And in about three to three and a half years, I hope to have an arena up and the start of some residential development. That meant he expected approval by end of 2004 rather than 2006, as it turned out, and an arena up by 2006 or 2007, instead of 2010 or 2011, as the best-case scenario now suggests. And, as I noted yesterday, he was already hinting at a switch from office space to housing. BL: Does the city have to approve the project, are there hurdles yet? BR: It’s on state land, being the Long Island Rail Road,, so it’s a state process, and yes, there’s a whole approval process, the state. No, less than 40 percent of the site is state land, so the state process was not required. After all, the West Side yards project in Manhattan is going through the Uniform Land Use Review Procedure, or ULURP. BL: You have 30 seconds of free time. BR: It’s a very important project, we need housing in this city, we need office space, when the market comes back, for companies not to leave the city. Note that he was already hinting that the market for office jobs was already tanking. BL: Would there be affordable housing structured in? BR: It’s very important that we have a mix of housing, affordable to middle-income, that’s what the city needs, up to market rate. It’s very critical to the city. The mayor said we need 50,000 housing units, this would be 4000 of those. Actually, the mayor wanted 65,000 units of affordable housing and Atlantic Yards would contain 2250 units. However, it could take 20 years to deliver those units, as even project supporters predict, and none would be online by 2008, the mayor's original target date. The mayor's original goal, 65,000 units by 2008, has become 165,000 units by 2013. The role of Atlantic Yards in meeting that remains in question, given the current squeeze on tax-exempt bonds.